George Bolster’s newest series of works are inspired by the fragmentary nature of short, separate ideas evident in the book Pensées by 17th Century French philosopher Blaise Pascal. Pensées is a launching point for text works that use language as the basis of investigation. The exhibition centers on a large-scale installation piece called Cultural Production/Cultural Erosion. 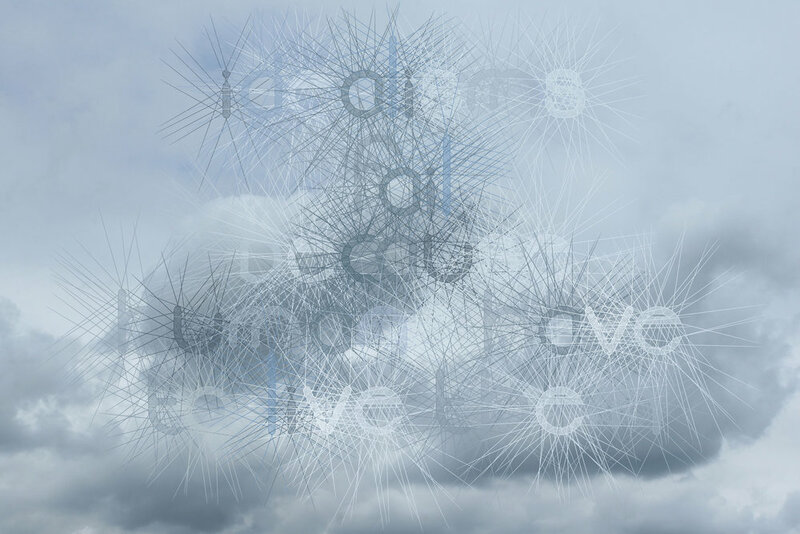 This cloud container contrasts the representational images inside its hermetically sealed structure with the real clouds filling it at intervals. Vapour pumped into the installation will flow periodically throughout the structure, first partially and then completely obscuring the images. 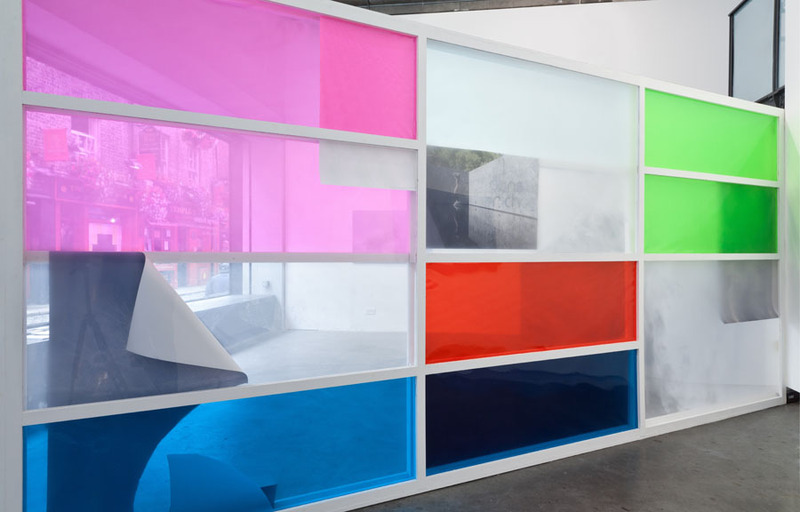 The variously coloured Perspex walls will mix and change colour as the vapour dissipates, revealing and eroding the images and ideas held within. Bolster’s photographs are comprised of a merging of both text and image. The text was drawn from a font created digitally by the artist, as an extension of his drawing practice. The lines that both describe and obscure the letters deliberately hinder a straightforward reading of the messages that possess the punctuation-free brutal immediacy of texting. The colour of each letter is sampled from the representational image beneath it, leading to the camouflaging of text through tonality and color. The letters recede and advance towards the eye making words incomprehensible until the viewer comes close to the piece to see the detail. 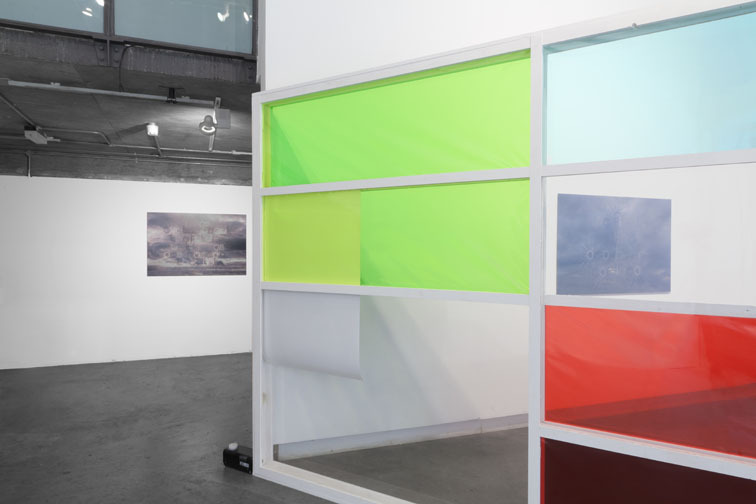 In addition, the cloud imagery used here (of Dublin sky-scapes made during his Residency at Fire Station Artists’ Studios) furthers these ideas by serving as a metaphor for the temporal in ideas, ideals, and belief systems. Cultural Production/Cultural Erosion, 2013. Transparent vitrine wall which fills with smoke obscuring the images housed within. Acyrlic sheet, wood, paint, c-type prints. 16' x 10' x 4". Installation photograph by Davey Moor. we fight to the death for dead ideals, 2013. (detail) Chromogenic print. idealisms fail because humans have to live them, 2013. (detail) Chromogenic print.